Immediately upon arrival at the conference, we hit the ground running to an invite-only event in a small banquet room crowded with bloggers and their pets. Boca was a great sport from the get-go - our main trouble was that she was a bit too relaxed. She kept flopping down and creating a road hazard in the tight space. I saved her from having her paw or tail stepped on several times. As I listened to the presentation and chatted with friends old and new, Boca set her unwavering gaze on me as I doled out positive reinforcers (i.e. snacks) from our awesome new treat bag. 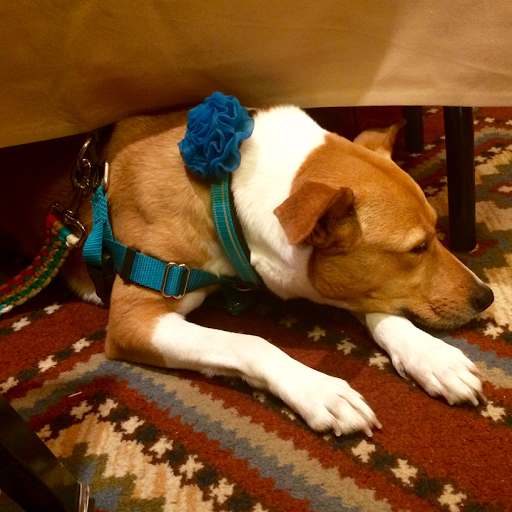 Although I wanted to keep Boca on her normal routine as much as possible, I knew we'd be spending a lot of time in novel and stressful situations, between the one- to three- hour long sessions, the hubbub of the vendor hall, and the chaotic camaraderie of the happy hours and meals. I didn't want to upset her stomach with a huge influx of rich treats, so I made a "trail mix" of her regular ration of Open Farm kibble combined with two kinds of treats of varying textures. I got so many compliments on Boca's good behavior, but I honestly don't feel like I can take a lot of credit for her lovely demeanor. She is happy to lounge or slouch almost anywhere, and whether she was taking a nap or making me laugh with her intense laser stare, she was both exactly how I expected her to be and so much more. I gave her quite a bit of down-time in her crate in the room - she happily went in and curled up, sound asleep upon our return. I am so thankful that Boca loves her den - it makes traveling a breeze! 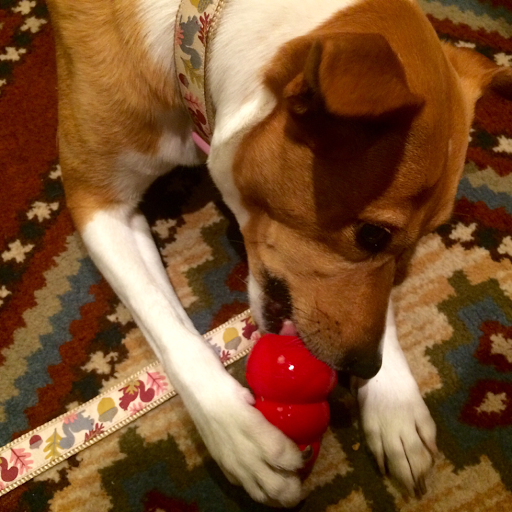 By the second day she seemed like an old pro, choosing her own seat and settling down with a Kong. On Saturday I could tell that pets and people alike were getting a little worn down; a few dogs were snappy and some looked like they would rather be anywhere else. 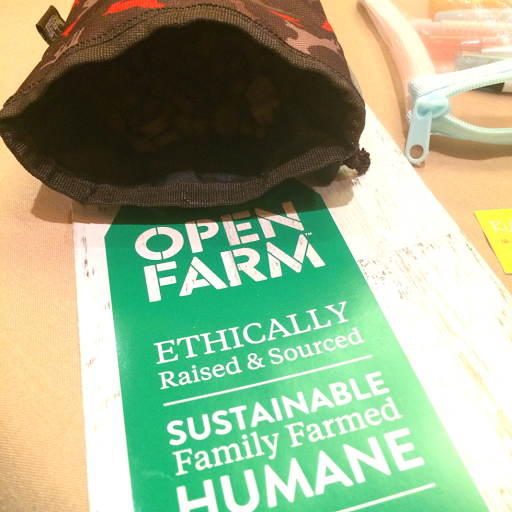 Overall, I was really impressed with the animal attendees and the many ways the conference organizers and the Sheraton Grand accommodated all of our needs. Boca enjoyed the water fountains and delicious samples that were to be found in the exhibitor hall. She even did a few tricks to everyone's delight, and made her way into quite a few brands' social media feeds from the event. Boca isn't a particularly friendly dog, at least not in an excitable way. I describe her as dog-neutral but she was happy to pose with a few friends. I was thrilled to meet talented trick dog, Just Jesse. Many people asked about Ruby and I could not even imagine her in such a demanding environment. I have the most reactive and the most non-reactive two dogs! Boca barked twice in the entire four days we were at the hotel - once at a dog outside our patio window and again at a golf cart. We did have a couple of minor fear issues: the first was the mister in the dog potty area. The mist was a welcome relief in the 110+ degree heat, but it was run by a loud motor right by the entrance. Boca was spooked by it which limited our use of the main potty area. Luckily, we had a first-floor room with our own patio door to the stunningly landscaped desert grounds! I wasn't expecting that and it solved the complicated logistics I had been picturing, winding through endless hotel hallways first thing in the morning and last thing at night. 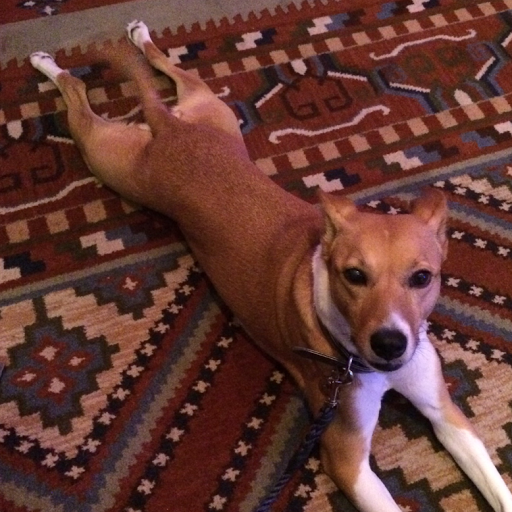 On the last evening at the awards dinner, Boca was so relaxed that she was sprawled out Madame Frogpants style with her tail wagging while we applauded the Nose to Nose winners, but unfortunately something frightened her and we had to make an early exit. I think one of the speakers crackled, because she started trembling like she does during thunder or fireworks. She made a quick recovery back in the room and was no worse for wear. 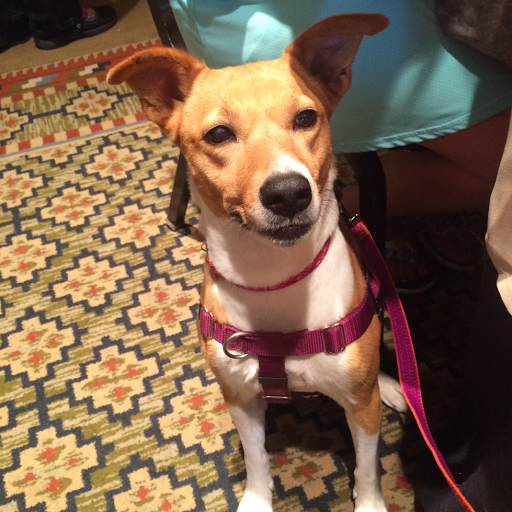 I am so proud of my little street mutt, who charmed everyone she met and behaved like a model citizen. It was hard not to feel like a minor celebrity's PR manager when people recognized her and ran over to meet us. I loved seeing her through other people's eyes and the laughter she elicited as she slouched against a vendor display or stood up on the table to see what the humans were eating. I am proud of myself that I didn't underestimate her and decide not to take her, or overestimate her comfort level and cause her undue distress. She made me look like a good trainer when the truth is she's just a good dog. We made a great team and it was a solace and delight to have her at my side - it was most definitely a positive experience for us both. I'm glad you had such a positive experience! It sounds like she was the perfect dog for this type of event and from the pictures, it definitely looks like she could get used to the glamorous celebrity lifestyle ;) By the way, I LOVE that squirrel collar and leash--so cute! I can't get over Madame Frogpants style, seriously. I'm so thrilled to hear how well she did. It's really awesome that so many pets were able to accompany their people & mingle in such a chaotic environment. I love that no matter what went on Boca was completely chilled out & ready to relax at the end of the day, she's such a good girl. I'm glad it worked out so well for both of you! I think that knowing your dog as well as you do, made it a good experience for both of you. I bought my ticket for next year (first time attending! ), but I don't think my dogs would enjoy going. 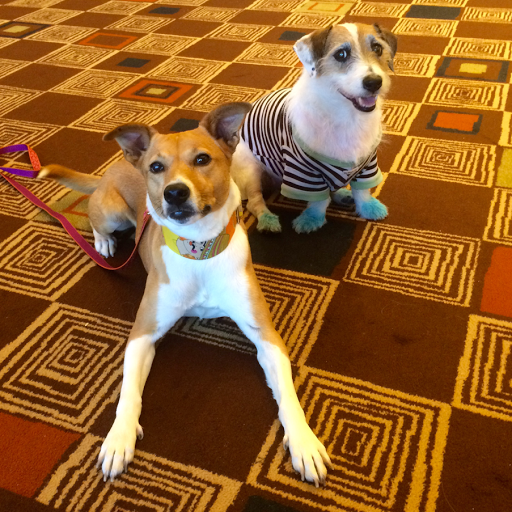 I really enjoyed meeting you and Boca at BlogPaws. It sounds like she did really great for her first big outing. 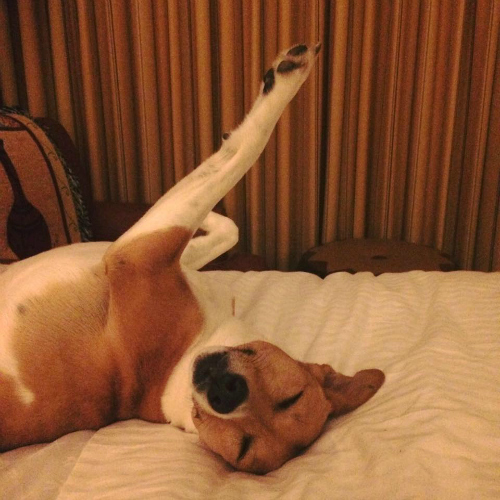 And I love the last picture, with her sleeping on her back with her legs in the air! 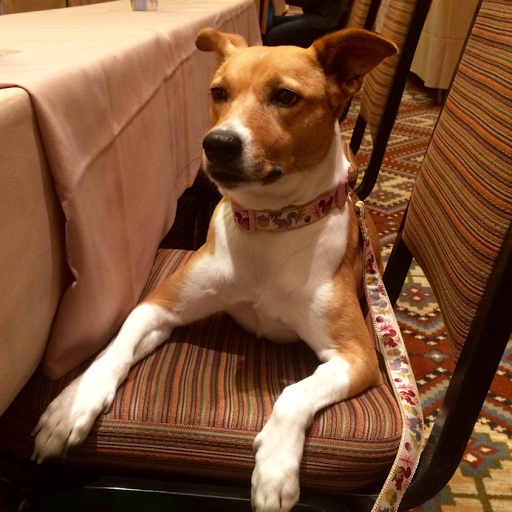 Awesome that she was able to adapt to the strange circumstances of BlogPaws with relative ease. Every time I saw here she was doing great! I really wanted to say Hi but always had our boys with me who can be very in your face! You know, I think that being "dog neutral" is probably ideal for an event like that! Much easier and less stressful than being "dog thrilled," unless it's an older dog who has lots of impulse control work under their belt and doesn't feel conflicted about the concept that they can play with some dogs, but not all dogs, and not all of the time, you know? We didn't get to talk much but it looked like Boca was doing great. I'm glad she had a good time. Mr. N had a couple of bad run-ins with other dogs charging at him but he bounces back really quickly, thankfully. Boca got snapped at twice - both times I didn't see exactly what happened as my back was turned or I was talking to someone, but my friend told me they were not isolated incidents with those same two dogs. I'm glad Mr. N. is resilient! What a little fashion plate! So many costume changes. Good job Frog Dog and mama! It was so great to meet the both of you! She was incredibly well behaved, indeed. I was surprised to see just how many dogs got stepped on while there! Made me thankful to have Nola up off the floor. Sounds like she did brilliantly! It's so lovely to think how vastly you've changed her life for the better! 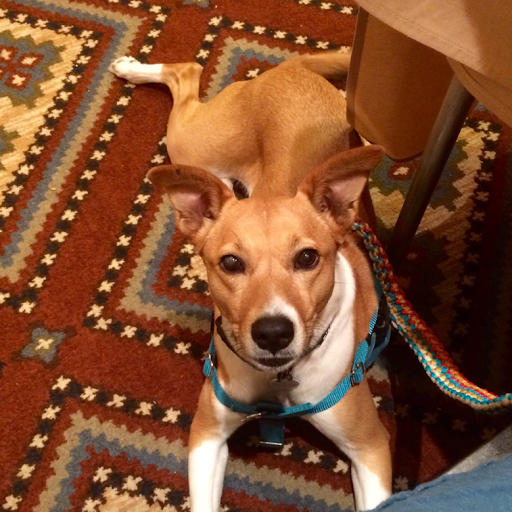 Glad to hear blogpaws was a success. Nothing charms more than an adorable, well behaved dog! This is one lucky dog! I'm so glad it went well for you and you both had such a wonderful time! Wish we could have been there to meet you...maybe next year? Sounds like Boca did a great job and handled the conference like a champ. We didn't bring Ruby, but hope to next year.